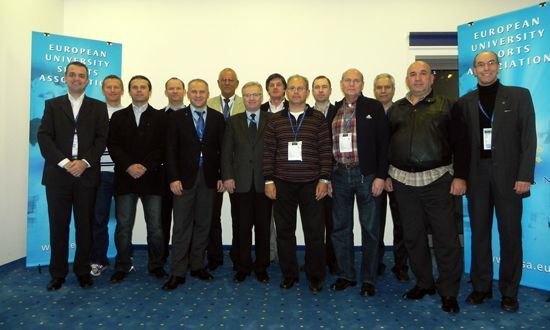 The official part of the 2010 edition of the EUSA Convention concluded today. Over 50 participants, representatives of the Organising Committees of the next year’s European Universities Championships and the technical delegates have gathered in Bled, Slovenia to discuss the topics related to the organisation of the European Universities Championships, see best practises and get useful information for organising a successful event. 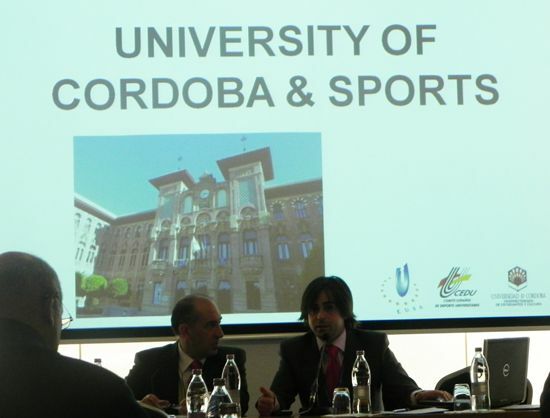 Today, the representatives of the Organisers of the European Universities Games, Mr Vicente Martinez Orga and Mr Rifaat Chabouk, presented the concept and preparations for the 1st European Universities Games, which will take place in Cordoba, Spain in 2012. This will be the first edition of the EUSA multisports event, where participants of the European universities will participate in 10 sports: beach volley, badminton, basketball, football, futsal, handball, rugby 7’s, volleyball, table tennis and tennis. 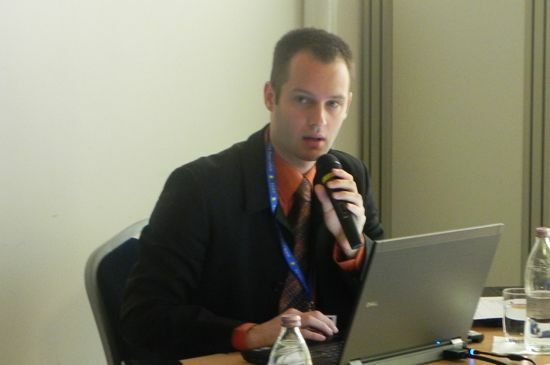 Mr Andrej Pisl, EUSA Communications Manager presented the EUSA online registration and accreditation system which was put in place in 2010 and will be used by the future organisers of the European Universities Championships. 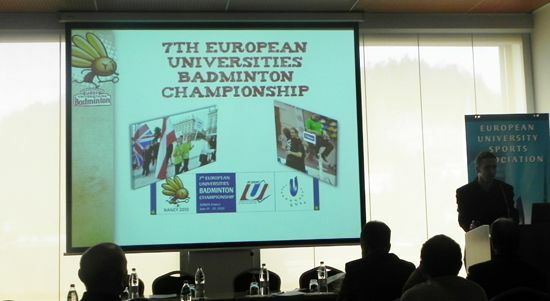 EUSA invited the representatives of the 2010 European Universities Badminton Championship to present their championship as an example of best practice. On behalf of their organising committee, Mr Valentin Dupoey presented their experiences and pointed out the topics where special attention should be given to. 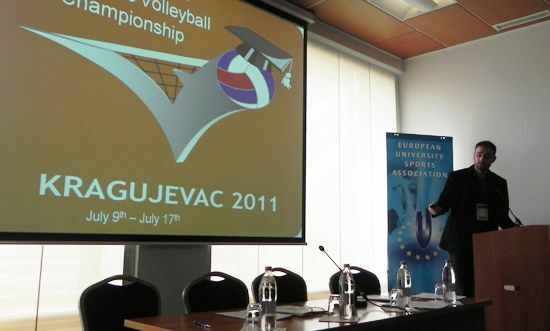 Representatives of the organising committees of the European Universities Championships 2011 presented their events to the participants. Mr Chabouk presented the EUC Basketball in Cordoba, Mr Matti Anttonen presented the EUC Futsal in Tampere, Mr Muslum Gulhan and Murat Aslan presented the EUC Football in Istanbul, Mr Marko Zunic and Mrs Ivana Anicic presented the EUC Handball in Rijeka, Mr Philippe Gars presented the EUC Rugby 7s in Lille, Mr Luis Silva presented the EUC Table Tennis in Madeira, Mrs Kamelia Atanasova and Mrs Iliana Eneva presented the EUC Taekwondo in Sofia, Mr Marko Petrovic presented the EUC Volleyball in Kragujevac and Piotr Dybicz the EUC Bridge in Warsaw. The president of the Sports Association of Bosnia & Herzegovina Mr Omer Stambolic presented the championships in Judo and Karate which is to be held in Sarajevo. 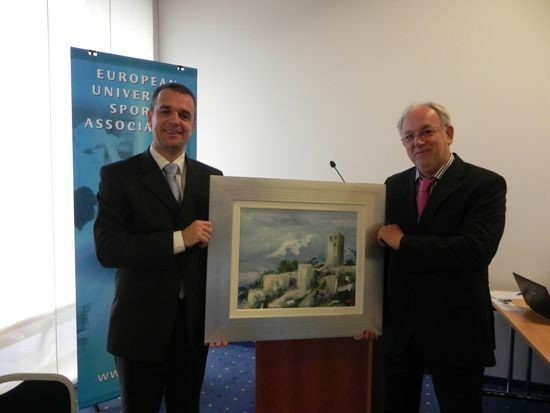 At this occasion Mr Stambolic also handed a present to the Secretary General Mr Matjaz Pecovnik as a welcome present for the new EUSA Office. 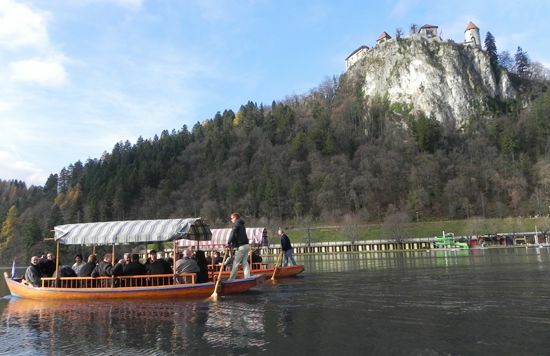 After the presentations, the participants enjoyed a sightseeing boat tour to the Bled island and a scenic walk by the lake. In the afternoon, parallel workshops were organised for the organisers and the technical delegates to discuss the details of the championships. The technical delegates also met for their internal meeting to discuss the technical aspects, rules and regulations and the plans for the future. At the same time, the Medical Commission met to discuss the medical matters and the recommendations for the organisers of the EUSA events.